This document demonstrates that all properties belonging to the Bahá’ís of the village of Kata, in the province of Kohgilouiyyeh and Buir-Ahmad, were officially confiscated in the year 1373  by the order of the Governor of Islamic Revolutionary Court of Yaasouj, which was authorized by the representative of the Supreme Leader. 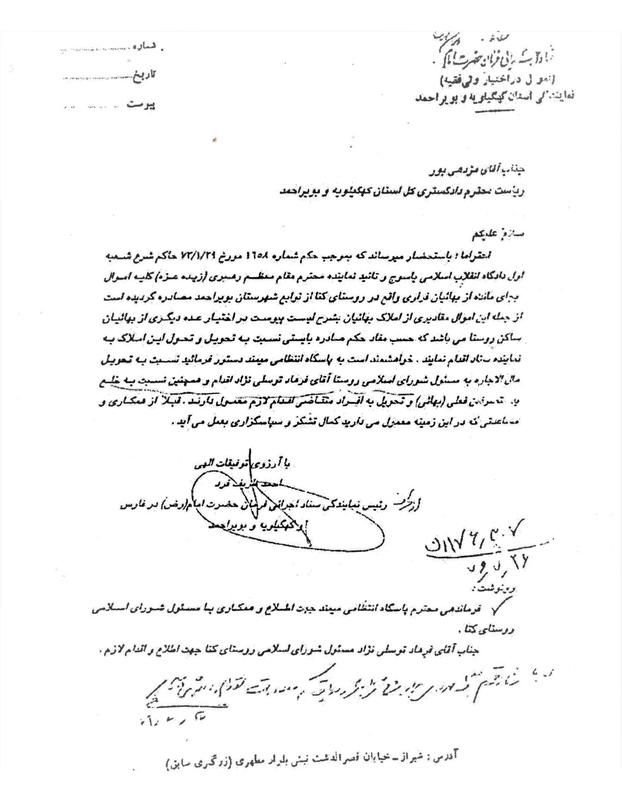 However, several years later, in a letter addressed to the Chairman of Judiciary of the Province, the Chairman of the Headquarters for the Execution of the Commands of His Holiness the Imam [referring to the Supreme Leader] of the Province of Kohgilouiyyeh and Buir-Ahmad, refers to this document and informs of the existence of certain numbers of the confiscated properties that belonged to the Bahá’ís of the above-mentioned village, which are still in the possession of the some of the Bahá’ís in the village. He then orders that the provisions of the document must be executed and the relevant authorities take action to confiscate and transfer the properties to the Headquarters for the Execution of the Commands of His Holiness the Imam. You are being respectfully notified that pursuant to the warrant No. 1658 dated 73/1/29 (18/4/94) issued by the justice of the primary court of the Islamic Revolution of Yasouj and as confirmed by the representative of the Honorable Supreme Leader (May His Glory increases by day), all the abandoned assets of the Baha’is who have fled the village of Kata, one of the surrounding villages of Boyer Ahmad province, are expropriated. These assets include certain properties that are currently in the possession of other Baha’is of the village, the list of which is attached, and are to be taken over and delivered to the representative of the court according to the provisions of the issued warrant. Please direct the police station of Meymand to proceed with securing and delivery of the said properties to the responsible agent of the Islamic Council of the village, Mr. Farhad Tavasoli Nejad. Furthermore take necessary action in seizure of the properties from the current occupants (Baha’i) and their delivery to the relevant applicants. Your co-operation and assistance in this matter is much appreciated in advance. Police Chief of the Meymand, police station, for information and cooperation with the person in charge of the Islamic Council of Kata village. Not legible sentence with signature and date.